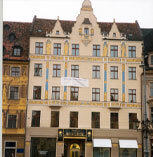 Peter Koppenheim’s parents owned this building in what is now Wroclaw, Poland. It was confiscated and sold by the Nazis and nationalized after the war. In the 1990s, Poland gave the property to the heirs of the Nazi sympathizers who bought it from the Nazis. The heirs, in turn, sold it to the international corporation Thyssen Krupp. In an attempt to make progress on Eastern European property restitution during the final days of the remaining Holocaust survivors, the U.S. Congress, urged by the Claims Conference, is considering resolutions calling on countries in Eastern and Central Europe to immediately enact legislation for the return of or compensation for individual and communal properties seized or lost during the Nazi era. In a rare bipartisan act, groups of U.S. Senators and Representatives have introduced resolutions that urge “fair, comprehensive and just” laws addressing the restitution of property. The Claims Conference has been working closely with members of both houses on these proposed resolutions on a bipartisan basis. These historic resolutions are the first time that the U.S. Congress has cited the lack of Holocaust-era restitution progress in Poland and Lithuania, both of which are singled out in each resolution. None of the Polish governments since the fall of Communism have passed private property restitution legislation, making it the only country in the European Union without such laws. Lithuania, with numerous Jewish communal properties at stake, has no law to enable recovery of or compensation for Jewish communal assets lost during the Shoah. The Claims Conference and World Jewish Restitution Organization have been working in the Senate with Senator Bill Nelson (D-Fla.) and Senator Gordon Smith (R-Ore.) and the other sponsors of the resolution, Ben Cardin (D-MD), Norm Coleman (R-Minn.), and Robert Menendez (D-NJ). In the House of Representatives, the proposed resolution was initiated by Robert Wexler (D-Fla.) and has received bi-partisan support from the Chair and Ranking Member of both the House Subcommittee on Europe, Mr. Wexler and Elton Gallegly (R-Calif.), and the Chair and Ranking Member of the full House Committee on Foreign Affairs, Howard Berman (D-Calif.) and Ileana Ros-Lehtinen (R-Fla.), along with the Chairman of the Helsinki Commission Alcee Hastings (D-Fla.). Original co-sponsors of the proposed resolution were Representatives Eliot Engel (D-NY) and Steve Chabot (R-Ohio). “The United States government has been crucial to the process of Holocaust-era restitution and compensation. Eastern European property restitution is one of the major unresolved issues and a current priority for us. We welcome this strong support from the Senate and House and hope that it prompts these governments to help restore assets to rightful owners and heirs,” said the Claims Conference.